Image editing software is more useful than ever. Now that more and more people have access to computers and digital cameras. Even smartphones allow people to capture images at any time. Online social networks give people a convenient means of sharing them. In many cases, people would want to use an image editing software to make the best quality pictures before posting them online. For those who like it simple and easy, the popular Paint.NET 4.0 software may be the best option available. Paint.NET is an image editing software that most people may already have known. It is an ideal replacement for the Microsoft Paint software that usually comes with Windows PC’s. It comes with more extensive features that many people look for in an image editing software. The new Paint.NET 4.0 now comes with a brand new fully multithreaded rendering engine, which offers better performance scales when editing larger images. It also comes with improved selection tools. An updated general user interface places the tools on the corners of the program window when opened to make them more accessible. The new version also comes with direct drawing support with blending mode along with the use of soft brushes for brush tools. The new version also comes with smoother mouse inputs for drawing tools. And just like the previous Paint.NET version, this image editing software also comes with a selection of filters and special effects features built in. The software also offers unlimited undo levels so that users can always go back to the original image when needed. What makes it even more ideal is that for a powerful image editing software solution, Paint.NET 4.0 is free to download. 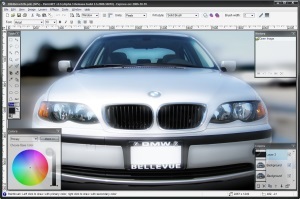 It has the features that most people will ever look for in an image editing software package but available for free. Interested users can download it from getpaint.net.